New Acquisitions 2012, a set by Abbe Museum on Flickr. 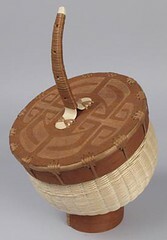 The Abbe Museum in Bar Harbor, Maine has added new acquisitions to its permanent collection in 2012 including a nice selection of Maine Indian Brown ash baskets and Birch Bark vessels. The artisans responsible for this new work include Sarah Sockbeson, Penobscot, Diane Campbell, Passamaquoddy, George Neptune, Passamaquoddy, George Neptune & Molly Neptune Parker, Passamaquoddy, Fred Tomah, Maliseet, Aron Griffith, Maliseet and Eric Otter Bacon, Passamaquoddy. The Hudson Museum is the sponsor of frequent basketry related exhibits and programs. They are presently the host of Transcending Traditions: The Next Generation and Maine Indian Basketry through December 29, 2012. The exhibit features five contemporary Maine Indian basketmakers representing the next generation: Jeremy Frey, Ganessa Bryant, Sarah Sockbeson, George Neptune and Eric “Otter” Bacon. This project explores the new directions that these innovative artists are taking the tradition in the face of environmental and economic challenges.